'R.O.T.O.R.' is another data point in the graph that shows the coolness of a movie’s box art is often inversely proportional to the quality of the movie, and let me tell you, R.O.T.O.R.’s box art is pretty darn cool. 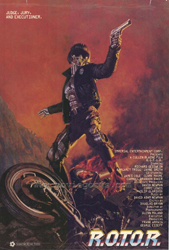 Although the robot on the cover looks nothing the mustache sporting vigilante of the film, he does look strangely like the rogue cyborg from a different Robocop rip-off, 'Vindicator' (1986). Perhaps they can team up the guy from “Eliminators” (1986) and have some kind of Avengersesque film about low-rent man-machines. 'R.O.T.O.R.' is primarily the story of one Mr. J. Barrett C. Coldyron (pronounced ‘cold iron’), a tough talking Texan who happens to be a brilliant robotics scientist. Coldyron’s boss is pressuring him to complete the Robotic Officer of the Tactical Operations Research Unit (shouldn’t his name be R.O.T.O.R.U?). Coldyron tells them it isn’t ready, but thanks to some underhanded meddling and two idiots; one a comic book reading robot and the other a horny guy named, Shoeboogie(? ), R.O.T.O.R. is awakened. He quickly beats the hell out of some plastic chairs, steals a motorcycle and heads out to dispense justice. Coldyron teams up with a lone survivor of a R.O.T.O.R. encounter and a body builder/scientist named Dr. Steele (no really) to hunt down the wayward robot before it kills more people. Going into 'R.O.T.O.R. ', you know it’s not going to be any good, but what it does is surprise you in the numerous and inventive ways it’s not good. Let’s start with Mr. Coldyron , he’s a gruff unsympathetic main character that’s way too cool. He happily guns down people robbing a convenience store, and spends the day throwing knives at trees when he’s not trying to impress girls by telling them about ‘Blood Eagles.’ R.O.T.O.R. himself is the very definition of underwhelming villains, I don’t know who thought a paunchy cyborg with a chintzy mustache was menacing, but he isn’t. The fact he can easily be stopped by shouting or honking your car horn doesn’t help his credibility as a threat either. To be fair though, a chunky cyborg with a bad mustache would blend in with a majority of the real live cops I’ve seen. Put some lame main characters in movie that also sports a wise cracking robot, some racial stereotypes, action scenes that make no sense, an epilogue that goes for downbeat but ends up somewhere around criminally stupid, and you start to get that magical brew of an amazingly terrible film. The thing that brings it all together and makes it a wonderful train wreck of a movie is that, despite the humor, it’s all played seriously. You’re supposed to believe that R.O.T.O.R. is an unstoppable machine. You’re supposed to realize that Coldyron is the only one smart enough and sensible enough to stop all this mess. You're supposed to gasp in wonder at what is possibly the worst stop motion animation put to film when they give you a schematic of R.O.T.O.R.’s internal skeleton. For just a moment you’re supposed to believe the cool robot on the cover has anything at all to do with what happens in the movie. That cover looks like it would be better suited to a death metal album...or a RIFTS supplement. Willard The Robot was the best part! Haha.